I know harassment when I see it. It’s when someone makes an unwanted advance. It’s offensive. 1. 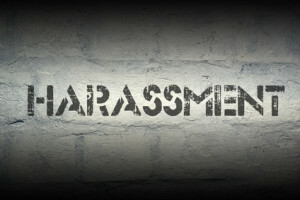 The harassed person is the judge of harassment. 3. The behavior is repetitive. Recently my internet service became exceptionally slow. When I called up my internet provider, they ran me through a sequence of “turn off” and “turn on” checks. Each piece of equipment, the modem, the wireless router, and the computer, was powered down and then restarted. Each trial sequence took 20 minutes to complete. When that didn’t work, I was escalated to a higher level of technical support. Again we go through the same series of “turn off” and “turn on” checks. Another 20 minutes of testing and then they agree to send out a service technician. Fifteen minutes later, I receive a call from another technician — just to double-check before the service technician comes out to physically check the lines. We go through the same series of “turn off” and “turn on” procedures. Same dead-end results; they will have a service technician come out tomorrow. In the meantime, I call up the manufacturer of the modem. Immediately, it becomes obvious this person knows what he is talking about. He isn’t following a script. He instructs me on how to check the modem, and in less than five minutes he has isolated the problem to the incoming signal strength. Now why couldn’t the internet provider have done this, at least once? Answer: It wasn’t a part of their script. Customer harassment.